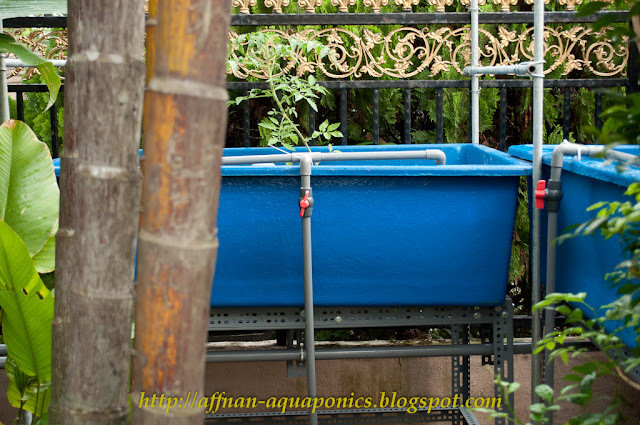 It was a pleasure to visit someone else Aquaponics set up, give me new ideas on how different arrangement Aquaponics can be practice. 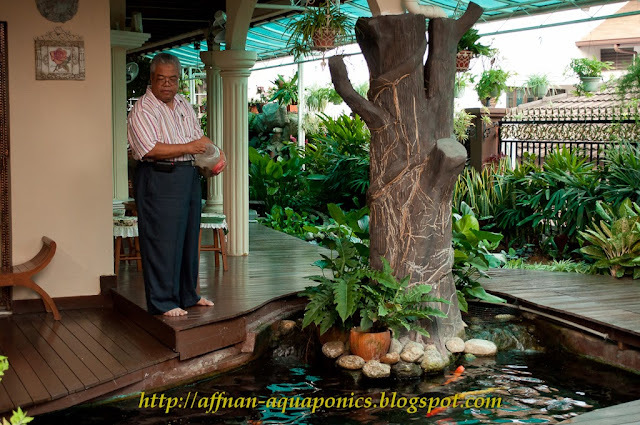 Encik Ahmad Aquaponics located in Shah Alam, about 30 minutes drive from my place. 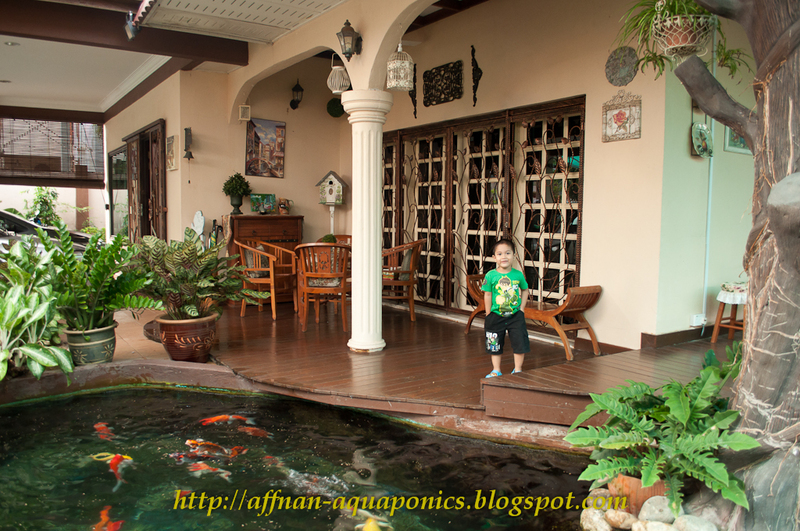 He is using his koi pond as water source for the Aquaponics..its a medium size pond with its own filtration in place. Water from this pond delivered to 4 growbed utilizing same pump as existing Koi installation, therefore its using surplus capacity that already there. Water return via sump tank, since its about 20 ft away to pond. He has manage to fine tune the siphon so that its works with this long return. 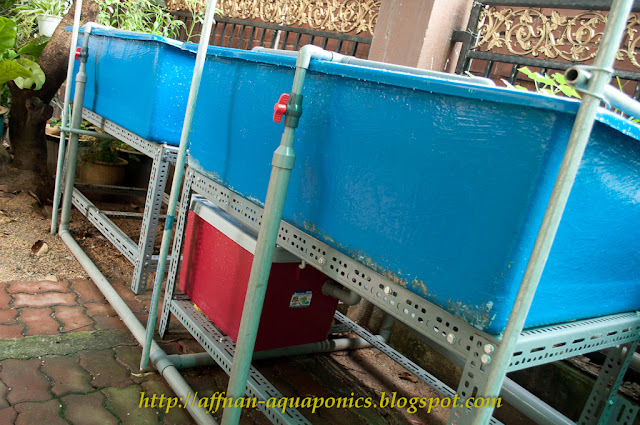 The red plastic box above is sump tank for 2 growbed. He use hardware angle iron as support and fibreglass tank as growbed with about 12 inches of granite. Its still relatively new about a month old and give another month or so it will mature and start to support those plants. He's slightly worried about granite size, some of it are very small and might cause water clogging. Only way is to monitor and see how it goes. 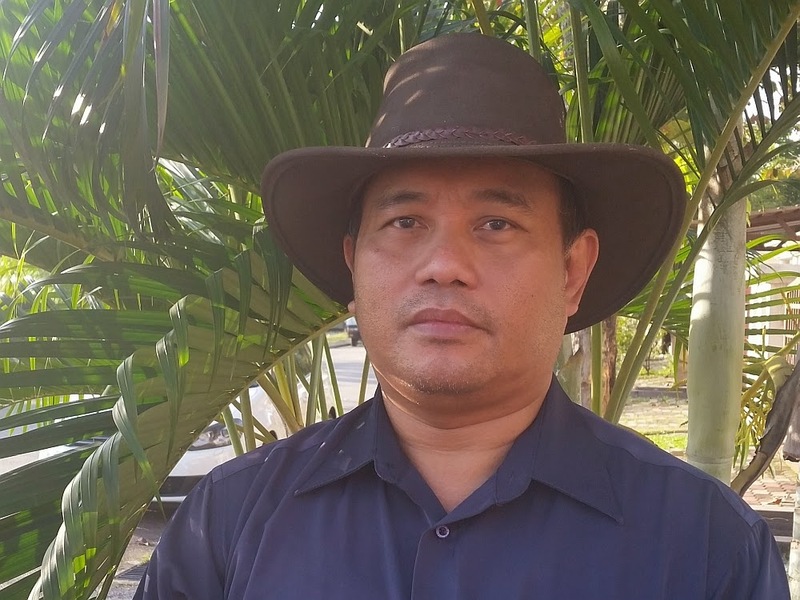 Another pair is in the front part of his yard, almost same arrangement and he's putting some shade to protect those young plants from the extreme sun. All in all En. Ahmad is on the right track and he knows what he's doing, good to see and I gain some knowledge after seeing his set. A very nice elderly gentleman En. Ahmad feeding his Koi, he's keen in replacing it with some other variety. 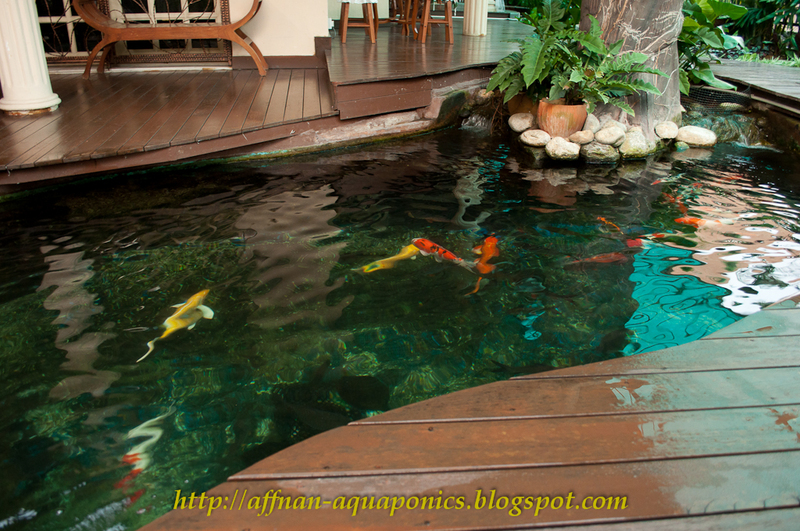 In this pond its already teaming with few species of fresh water fish. As usual Amir will be around to keep me on my toe. 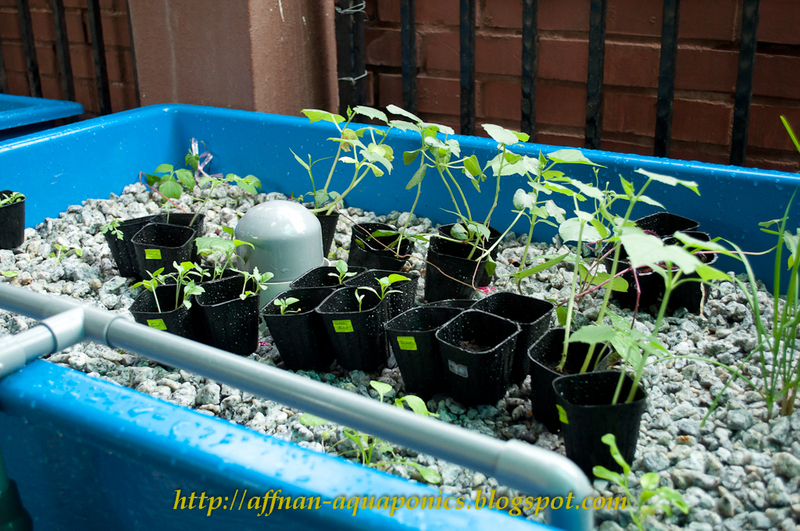 I'll visit again to see how's thing going with this set and learn setting Aquaponics on such a setup. what kind of filtration is being used in this system? how does it filter the large solids like leaves and debris? 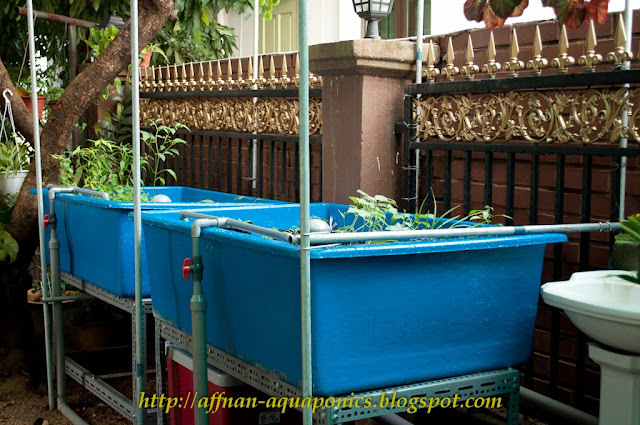 This person use normal mechanical filter for pond of this size, and part of the pumped water is use for the aquaponics setup. 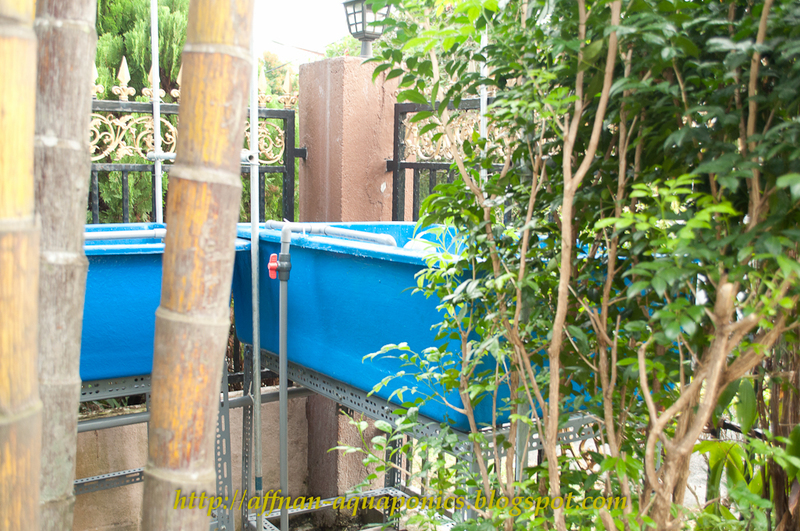 The Mechanical filteration take care of the leaves and debris. 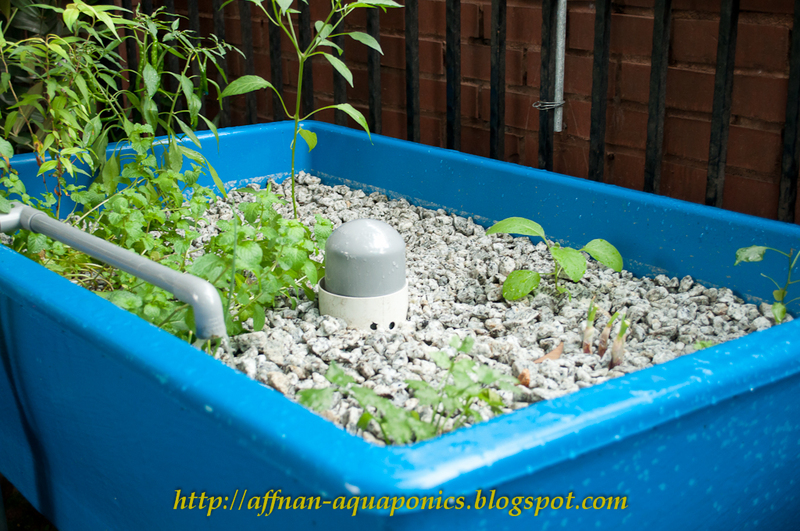 I am interested in starting my own aquaponic set up. is it possible if i can visit your aquaponic setup?